What were the most important issues or innovations discussed during the symposium and why? What directions might be taken by rural industries to re-vitalise public and private sector investment in Tasmanian agriculture? Suggest ways in which AIAST can play a role in addressing or advancing these cited issues. 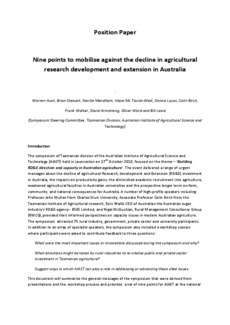 This document will summarise the general messages of the symposium that were derived from presentations and the workshop process and provides a set of nine points for AIAST at the national level to use in its advocacy role to mobilise against the decline in agricultural research development and extension in Australia.